Though Tallinn's Christmas market only became a yearly tradition in 2001, it has already established itself as amongst the most well-loved and happily-visited Christmas markets in Europe. Certainly what it lacks in tradition it makes up for in atmosphere and ambiance, dispelling December's darkness with colourful lights, music and activity. The last week of November, Tallinn's Town Hall Square (Raekoja plats) becomes cluttered with more than 50 merchant stalls where visitors and locals can admire and purchase products by artisans from all over Estonia. Surrounding an enormous Christmas tree hung with lights and decorations, these vendors sell a variety of original products including felted wool hats and slippers, buckwheat pillows, wooden bowls, wickerwork, elaborate quilts, ceramic and glassware, little sea-grass animals (so Estonian), homemade candles, wreaths and other decorations. 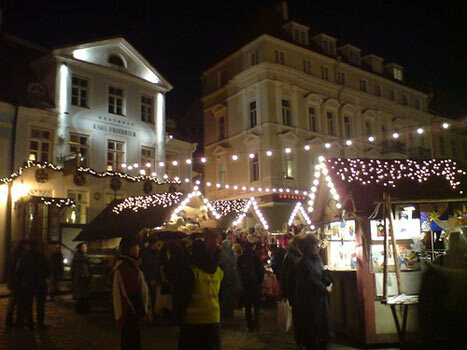 Holiday shows are common on the cobbled square and traditional Estonian holiday food is also served: pork, sauerkraut and blood sausages, hot soups, stir-fries. Other traditional treats include gingerbread, marzipan, various local honeys, cookies, nuts and sweets. Hot mulled wine poured from large wooden barrels keeps the crowds warm (as well as the local drunks whose noses become so red this time of year they could lead Santa's team). As for the Big Guy himself, he makes his rounds, posing with children and chillin' in the designated Santa Claus Cabin, where incidentaly, you can mail postcards from Santa's own post office (The Reindeer Express! or do they make the elves do that?). All in all, it's a glorious spectacle worth experiencing, with so much Christmas spirit it literally pinks your cheeks. You should have no problem finding gifts for your gal or souvenirs for yourself, and the prices are perhaps inflated for the season, but fair overall. (Though a haggle never hurt nobody, don't expect any big discounts.) The month-long market thrives through the end of December, but generally has a hangover after the holiday, closing up shop after New Year's unlike markets in other cities like Krakow. Open 7 days a week, from 10:00 till about 18:00. When does the 2019 Christmas Market start.? This past Christmas they were open from 24 November 2018 – 5 January 2019 so it will be similar dates this year :) Tallinn is so damn beautiful and chill, you're going to love it. Julemarkedet er en fantastisk opplevelse. Et av Europas flotteste markeder med opplevelser for hele familien. Billig Ã¥ handle og spise. Meget god mat og hyggelige mennesker. Ta turen - du vil ikke angre. Is it open the entire last week of November? Is there an official opening day? We are really looking forward to our visit in December. We are going to be there for a few days from 7th December. Any idea of the likelihood of snow then? Does this mean that the market is open on Christmas Day?